When I saw Jean Jullien's eloquent, artistic response to what happened in Paris on November 13, I immediately wanted to share the image with everyone I knew. I put it on Facebook and Instagram, but that wasn't enough of a reach for me. Then I remembered the old button maker I had stashed in storage. As I've pared away possessions that I have little use or space for, I've considered getting rid of it countless times. It's silly. It's a toy. I rarely use it for anything. It's never made me a dime. And frankly, it's a little embarrassing to own such a thing. On the other hand, it doesn't take up much space, every so often it's really quite useful, and honestly, at this point, embarrassment is not something I shy away from. I ordered a box of button parts and waited a few days for them to arrive. My master plan was/is to make 100 buttons with this beautiful bit of art, and give them away. That's it. I've seen them online already, being sold by various opportunistic sellers, and that makes me sad. This is not my art, so it's wrong to sell it, especially without permission, as I'm sure the folks on CafePress and Zazzle are doing. And besides, there's something so much more hopeful, joyful, and humanly connecting about just plain giving them away to anyone who wants one. To be clear, I am not a Rich Lady who can afford to do this endlessly. I have no income at the moment. I'm between gigs, so to speak, with no real clue as to what the next one will be. I thought if people asked to pay for the buttons, I'd accept $1 a piece, to cover the cost of the parts so I could order more. So far, only 2 people have offered to pay, so clearly this has to be a mission of Love on my part. And so it is. I don't mail them. I don't sell them. I don't even offer them to anyone who doesn't first make a comment on the one I'm wearing. And then, the real pleasure and perfection of this project is to pass this simple gesture of peace from my hand to that of another human being. It makes me feel incredibly, unreasonably happy. 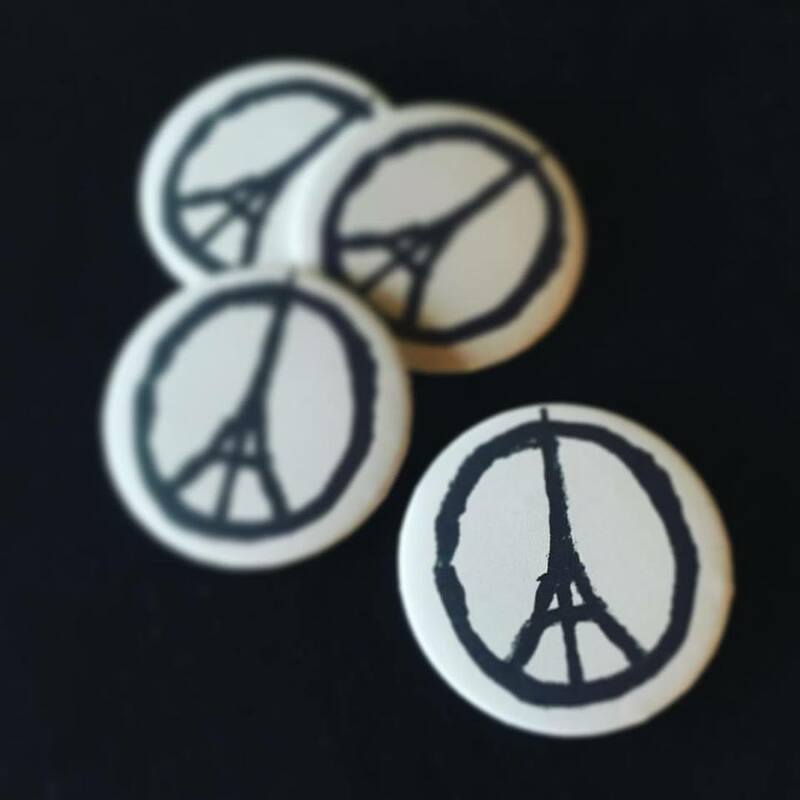 I was at the Portland Art Museum the other night, and a pretty young woman looked at my button, and quietly said, "Thank you for that," in her lovely French accent. As I pulled a button out of my pocket and handed it to her, I had no words. I only smiled, and turned away with tears in my eyes as she pinned it on her own coat, over her heart. Another day, on an impromptu excursion to the little town of Hood River, Rick and I wandered in to a little pop-up art and craft sale. One of the artists greeted us, and immediately asked where I'd gotten my button. This one had glitter and little gold stars in it, so I took it off and gave it to her. In return, I got a big warm hug. And the Peace goes on. I've made almost half of the hundred now, and really don't know how many Rick and I have given away between us. I love making them. It's a simple, repetitive, meditative process that goes quickly and takes minimal effort. My hand hurts from leaning down on the lever of the press, so I've started padding it with a pot holder. I make a dozen or so, and then I go out in the world and wait to see who they want to go to. If I go through this first hundred too quickly, I'll probably buy more. How long will people want these? I can't know that. How will I pay for them? Oh... somehow. I guess I'll know, one way or another, when it's time to stop. For now though, if you see me on the street, and you notice the simple Peace For Paris button on my coat, please ask me for one. I really would love to give it to you. I'm too far away across the country to get one of your buttons, but to know that this smidgen of thoughtfulness and love and peace is out there is good enough. That's all it should take.